You may not want to admit it but Christmas is just around the corner and for those looking to book the perfect Christmas party here at The Historic Dockyard Chatham, we offer a unique destination and venue that adds some sparkle and Christmas magic to your holiday party! Our Dockyard elves will soon begin decking the halls of our Mess Deck restaurant to fully dress it in to a Winter Wonderland fit for evening Joiner parties, festive Sunday lunches and private hires for up to 100 people. Even the Grinch's and Scrooges will be hiding their smiles of enjoyment! 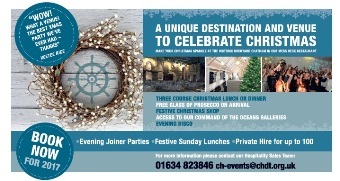 Booked events include a three course Christmas lunch or dinner with a FREE glass of prosecco on arrival. There will be access to our award winning Command of the Oceans gallery and an evening disco. Not forgetting our perfectly festive Christmas shop where you will find all those perfect stocking fillers and presents full of nautical and Kentish treats as well as much more!